Win every Truck Racer trophy. Come in 1st place in an event race. Race with a truck you bought. Have an engine breakdown in the last 50 meters of the race. Mount the podium 15 times in the championship. Win a race starting from the back of the grid. Post a time in all the Time Attack races. Beat your own record in an event race. Drift for over 5 seconds. Limp across the finish line with every part of the truck's bodywork damaged. Crash 5 of your opponents' trucks. Crash 15 of your opponents' trucks. Fill the Nitro bar and then use it all in one go without hitting anything. Do a complete lap without touching the decor. 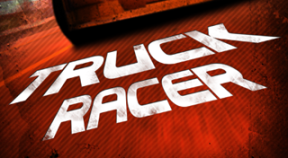 Finish an Expert race in a truck that has all of its original parts. Have an engine failure during a race. Restart a race you haven't finished on the podium for yet. Complete a race with a truck which has no more original parts. Drive all of the trucks in the championship. Buy all of the trucks. Win a bronze medal in every event. Win a silver medal in every event. Win a gold medal in every event. Win a platinum medal in every event. Finish the event "Engine On!". Finish the event "On Dirt". Finish the event "Asphalt King". Finish the event "Truck-Cross Cup". Finish the event "The Rampage". Finish the event "Rocky Competition". Finish the event "Weston Trophy". Finish the event "Raion World Cup". Finish the event "Royal KT". Finish the event "Team 41 Cup". Finish the event "All-Star Tour". Finish the event "Legendary Tournament". Come 1st in an online race. Take part in 5 online races. Take part in 10 online races. Take part in 25 online races. Come first in 5 online races in a row.